Draper, Inc. has announced a new mobile tool kit of Web tools for smartphone users. 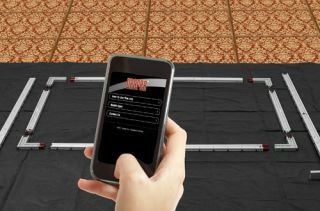 Draper’s mobile toolkit includes searchable document libraries for Draper projection screens, projector lifts and window shades for quick reference on the go. Also available for smartphones are assembly map tools for Draper’s StageScreen and FocalPoint projection screens. The assembly map tools allow users to figure out which pieces go where to build any size of Draper’s modular screens, without the need for access to a PC or laptop. Draper’s mobile toolkit works on all smartphones and can be found at www.draperinc.com/drapermobile. During InfoComm 2012, Draper, Inc. will be unveiling a new carrying case for rental products. Draper’s engineers have redesigned the carrying cases for the company’s rental products, such as FocalPoint, StageScreen, Ultimate Folding Screen and Cinefold. Draper has also added Velcro straps for stronger tie-down support, wheels for easy movement and an ergonomic inset handle to avoid stress on the arm when moving. Draper is also showing several new optional accessories for the company’s FocalPoint and StageScreen modular projection screens. Optional middle support sections and integrated special T-sections now allow for wider, stronger and flatter StageScreens, whether flown or on legs. A new optional longer leg base for FocalPoint allows for faster assembly and stronger support for large sizes. For a closer look, stop by booth #C8319 at InfoComm 2012, June 13-15 in Las Vegas.